This morning Daniel and I took a trip to Walmart to pick up some necessary groceries. I find the produce at Walmart more than adequate, with the exception of avocados which seems to always be prune-ish. Anyway, I got some carrots, zucchini, and cauliflower for no reason other than they were calling my name in the store – had no clue what I was going to do with them when I got home. Tonight when it was time to make dinner, I remembered a butternut squash soup recipe I had read about on the treadmill. Yes, reading while running is a tad unorthodox but it kills time if you can master the fine art of multitasking. Treadmeals are nothing more than meals I dream up while running … many inspired by the recipes in orphaned gym magazines. The side-dish recipe below is one that was inspired by a single simple ingredient in a butternut squash soup recipe (that I of course ripped out and brought home for a rainy day) – ROSEMARY. It’s a wonderful spice that seems to warm up your palate … and a little goes a long way. The photo is before roasting. Preheat oven to 350. Wash and slice vegetables, including garlic. Spray baking sheet with cooking spray and spread the vegetables. Generously season with salt and pepper and sprinkle with rosemary. Toss around with your hands to coat both sides with seasoning. Drizzle with oil if you like. Pop in the oven and roast for 20 minutes, until tender stirring occasionally. 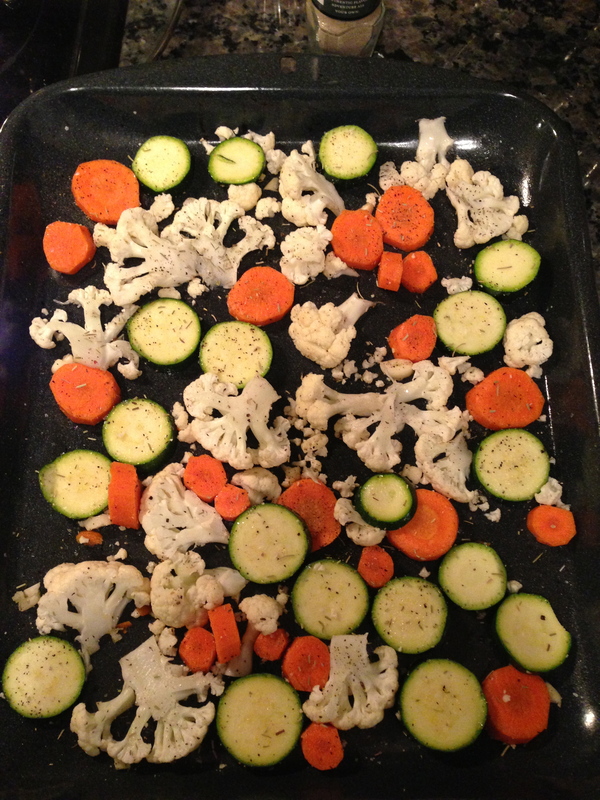 For browned and slightly cook vegetables, you can bump up the temp or use the broiler at the end of the cook time. Just make sure to watch anything under a broiler – it can burn quickly! At Walmart today, Daniel claimed not to care for cooked carrots or cauliflower. I’m so mean to make them anyway. Turns out, he does like them. That, my friends, is success! What did we have with these veggies? 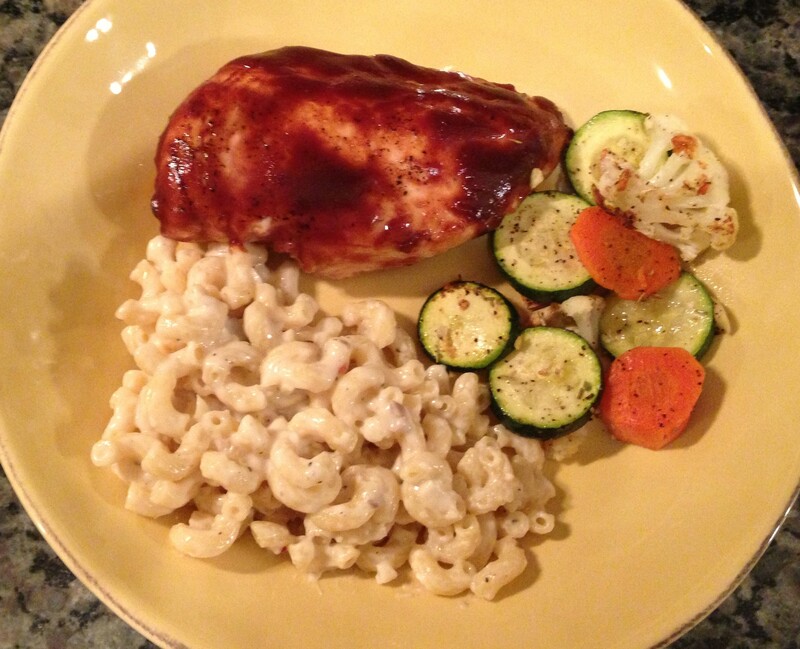 Baked BBQ Chicken and quick home-made macaroni. Previous post ← Hi and welcome!